A distributed, or partitioned, cache is a clustered, fault-tolerant cache that has linear scalability. Data is partitioned among all the computers of the cluster. For fault-tolerance, partitioned caches can be configured to keep each piece of data on one or more unique computers within a cluster. Distributed caches are the most commonly used caches in Coherence. Partitioned: The data in a distributed cache is spread out over all the servers in such a way that no two servers are responsible for the same piece of cached data. The size of the cache and the processing power associated with the management of the cache can grow linearly with the size of the cluster. Also, it means that operations against data in the cache can be accomplished with a "single hop," in other words, involving at most one other server. Load-Balanced: Since the data is spread out evenly over the servers, the responsibility for managing the data is automatically load-balanced across the cluster. Location Transparency: Although the data is spread out across cluster nodes, the exact same API is used to access the data, and the same behavior is provided by each of the API methods. This is called location transparency, which means that the developer does not have to code based on the topology of the cache, since the API and its behavior is the same with a local JCache, a replicated cache, or a distributed cache. Failover: All Coherence services provide failover and failback without any data loss, and that includes the distributed cache service. The distributed cache service allows the number of backups to be configured; if the number of backups is one or higher, any cluster node can fail without the loss of data. Since each piece of data is managed by only one cluster node, an access over the network is only a "single hop" operation. This type of access is extremely scalable, since it can use point-to-point communication and thus take optimal advantage of a switched network. Similarly, a cache update operation can use the same single-hop point-to-point approach, which addresses a known limitation of a replicated cache, the requirement to push cache updates to all cluster nodes. In the figure above, the data is being sent to a primary cluster node and a backup cluster node. This is for failover purposes, and corresponds to a backup count of one. (The default backup count setting is one.) If the cache data were not critical, which is to say that it could be re-loaded from disk, the backup count could be set to zero, which would allow some portion of the distributed cache data to be lost if a cluster node fails. If the cache were extremely critical, a higher backup count, such as two, could be used. The backup count only affects the performance of cache modifications, such as those made by adding, changing or removing cache entries. Modifications to the cache are not considered complete until all backups have acknowledged receipt of the modification. There is a slight performance penalty for cache modifications when using the distributed cache backups; however it guarantees that if a cluster node were to unexpectedly fail, that data consistency is maintained and no data is lost. If there are multiple levels of backup, the first backup becomes responsible for the data; the second backup becomes the new first backup, and so on. Just as with the replicated cache service, lock information is also retained with server failure; the sole exception is when the locks for the failed cluster node are automatically released. The distributed cache service also allows certain cluster nodes to be configured to store data, and others to be configured to not store data. The name of this setting is local storage enabled. Cluster nodes that are configured with the local storage enabled option provides the cache storage and the backup storage for the distributed cache. Regardless of this setting, all cluster nodes have the same exact view of the data, due to location transparency. The Java heap size of the cluster nodes that have turned off local storage enabled are not affected at all by the amount of data in the cache, because that data is cached on other cluster nodes. This is particularly useful for application server processes running on older JVM versions with large Java heaps, because those processes often suffer from garbage collection pauses that grow exponentially with the size of the heap. 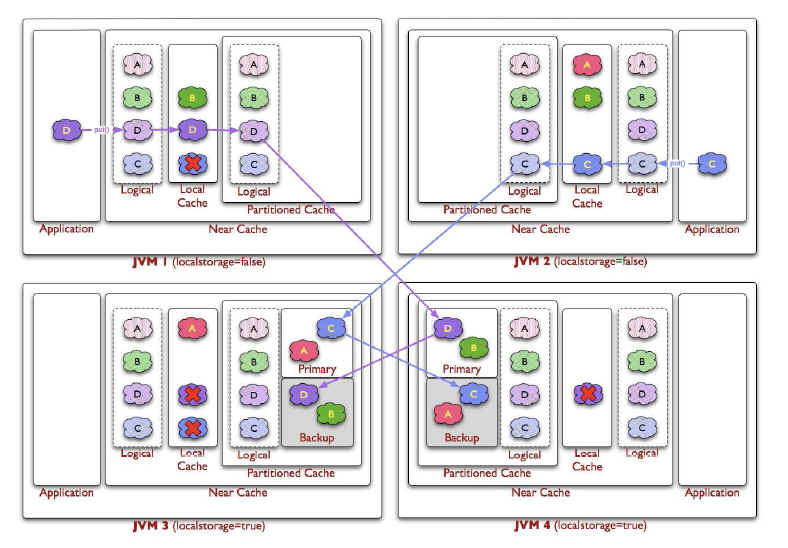 Coherence allows each cluster node to run any supported version of the JVM. That means that cluster nodes with local storage enabled turned on could be running a newer JVM version that supports larger heap sizes, or Coherence's off-heap storage using the Java NIO features. The local storage enabled option allows some cluster nodes to be used just for storing the cache data; such cluster nodes are called Coherence cache servers. Cache servers are commonly used to scale up Coherence's distributed query functionality. A replicated cache is a clustered, fault tolerant cache where data is fully replicated to every member in the cluster. This cache offers the fastest read performance with linear performance scalability for reads but poor scalability for writes (as writes must be processed by every member in the cluster). Because data is replicated to all servers, adding servers does not increase aggregate cache capacity. The replicated cache excels in its ability to handle data replication, concurrency control and failover in a cluster, all while delivering in-memory data access speeds. A clustered replicated cache is exactly what it says it is: a cache that replicates its data to all cluster nodes. There are several challenges to building a reliable replicated cache. The first is how to get it to scale and perform well. Updates to the cache have to be sent to all cluster nodes, and all cluster nodes have to end up with the same data, even if multiple updates to the same piece of data occur at the same time. Also, if a cluster node requests a lock, it should not have to get all cluster nodes to agree on the lock, otherwise it scales extremely poorly; yet with cluster node failure, all of the data and lock information must be kept safely. Coherence handles all of these scenarios transparently, and provides the most scalable and highly available replicated cache implementation available for Java applications. Coherence implements its replicated cache service in such a way that all read-only operations occur locally, all concurrency control operations involve at most one other cluster node, and only update operations require communicating with all other cluster nodes. The result is excellent scalable performance, and as with all of the Coherence services, the replicated cache service provides transparent and complete failover and failback. The limitations of the replicated cache service should also be carefully considered. First, however much data is managed by the replicated cache service is on each and every cluster node that has joined the service. That means that memory utilization (the Java heap size) is increased for each cluster node, which can impact performance. Secondly, replicated caches with a high incidence of updates do not scale linearly as the cluster grows; in other words, the cluster suffers diminishing returns as cluster nodes are added. An optimistic cache is a clustered cache implementation similar to the replicated cache implementation but without any concurrency control. This implementation offers higher write throughput than a replicated cache. It also allows an alternative underlying store for the cached data (for example, a MRU/MFU-based cache). However, if two cluster members are independently pruning or purging the underlying local stores, the store content held by each member may be different. A near cache is a hybrid cache; it typically fronts a distributed cache or a remote cache with a local cache. Near cache invalidates front cache entries, using a configured invalidation strategy, and provides excellent performance and synchronization. 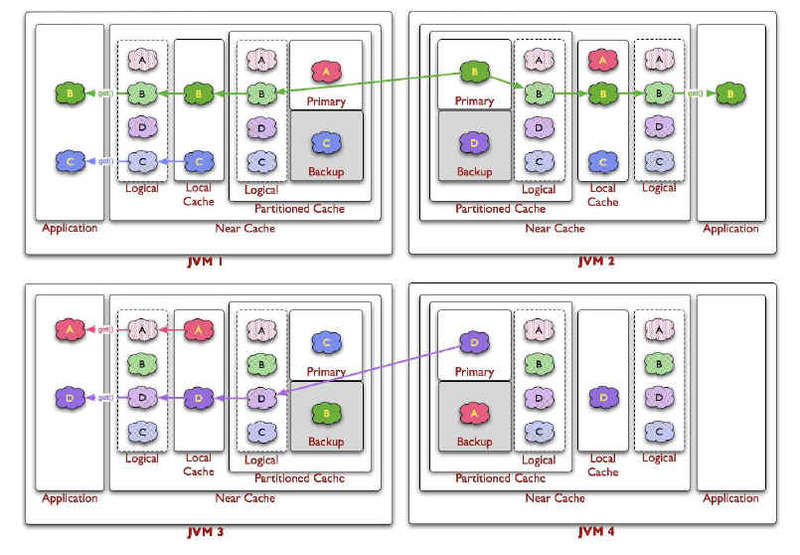 Near cache backed by a partitioned cache offers zero-millisecond local access for repeat data access, while enabling concurrency and ensuring coherency and fail over, effectively combining the best attributes of replicated and partitioned caches. The objective of a Near Cache is to provide the best of both worlds between the extreme performance of the Replicated Cache and the extreme scalability of the Distributed Cache by providing fast read access to Most Recently Used (MRU) and Most Frequently Used (MFU) data. Therefore, the Near Cache is an implementation that wraps two caches: a "front cache" and a "back cache" that automatically and transparently communicate with each other by using a read-through/write-through approach. The "front cache" provides local cache access. It is assumed to be inexpensive, in that it is fast, and is limited in terms of size. The "back cache" can be a centralized or multitiered cache that can load-on-demand in case of local cache misses. The "back cache" is assumed to be complete and correct in that it has much higher capacity, but more expensive in terms of access speed. The use of a Near Cache is not confined to Coherence*Extend; it also works with TCMP. This design allows Near Caches to configure cache coherency, from the most basic expiry-based caches and invalidation-based caches, up to advanced caches that version data and provide guaranteed coherency. The result is a tunable balance between the preservation of local memory resources and the performance benefits of truly local caches. The typical deployment uses a Local Cache for the "front cache". A Local Cache is a reasonable choice because it is thread safe, highly concurrent, size-limited, auto-expiring, and stores the data in object form. For the "back cache", a remote, partitioned cache is used. The following figure illustrates the data flow in a Near Cache. If the client writes an object D into the grid, the object is placed in the local cache inside the local JVM and in the partitioned cache which is backing it (including a backup copy). If the client requests the object, it can be obtained from the local, or "front cache", in object form with no latency. If the client requests an object that has been expired or invalidated from the "front cache", then Coherence automatically retrieves the object from the partitioned cache. The "front cache" stores the object before the object is delivered to the client. The local cache implements the same standard collections interface that the clustered caches implement, meaning that there is no programming difference between using a local or a clustered cache. Just like the clustered caches, the local cache is tracking to the JCache API, which itself is based on the same standard collections API that the local cache is based on. The local cache can be size-limited. The local cache can restrict the number of entries that it caches, and automatically evict entries when the cache becomes full. Furthermore, both the sizing of entries and the eviction policies can be customized. For example, the cache can be size-limited based on the memory used by the cached entries. The default eviction policy uses a combination of Most Frequently Used (MFU) and Most Recently Used (MRU) information, scaled on a logarithmic curve, to determine what cache items to evict. This algorithm is the best general-purpose eviction algorithm because it works well for short duration and long duration caches, and it balances frequency versus recentness to avoid cache thrashing. The pure LRU and pure LFU algorithms are also supported, and the ability to plug in custom eviction policies. The local cache supports automatic expiration of cached entries, meaning that each cache entry can be assigned a time to live in the cache. The local cache is thread safe and highly concurrent, allowing many threads to simultaneously access and update entries in the local cache. The local cache supports cache notifications. These notifications are provided for additions (entries that are put by the client, or automatically loaded into the cache), modifications (entries that are put by the client, or automatically reloaded), and deletions (entries that are removed by the client, or automatically expired, flushed, or evicted.) These are the same cache events supported by the clustered caches. The local cache maintains hit and miss statistics. These run-time statistics can accurately project the effectiveness of the cache, and adjust its size-limiting and auto-expiring settings accordingly while the cache is running. The local cache is important to the clustered cache services for several reasons, including as part of Coherence's near cache technology, and with the modular backing map architecture. A remote cache describes any out of process cache accessed by a Coherence*Extend client. All cache requests are sent to a Coherence proxy where they are delegated to a cache (Replicated, Optimistic, Partitioned). See Oracle Coherence Client Guide for more information on using remote caches. As a rough estimate, with 100mb Ethernet, network reads typically require ~20ms for a 100KB object. With gigabit Ethernet, network reads for 1KB objects are typically sub-millisecond. Requires UDP multicast or a few UDP unicast operations, depending on JVM count. Requires a few UDP unicast operations, depending on level of redundancy. Limited by local CPU/memory performance, with negligible processing required (typically sub-millisecond performance). Listener-based Near caches are coherent; expiry-based near caches are partially coherent for non-transactional reads and coherent for transactional access.